A recreational vehicle, also known as an RV, is an investment many families make to provide them with a wonderful way to explore Mother Nature, enjoy fun and educational trips with the family, and offer a method of travel that eliminates the needs for getting expensive hotel rooms for overnight shelter. When individuals take good care of their RV, they can enjoy this investment for many years to come. However, this may mean that Redlands area families consider long-term RV storage. In the city of Redlands, homeowners are unable to leave their RV parked in their driveway or on the street. This also leaves RVs, cars, and other large vehicles exposed to the elements which can cause damage to the paint, tires, and even the exterior over time. In order to keep an RV looking its best and allow it to last years without minimal problems, it is important to decide on long term storage options in a covered or indoor facility. At Vines Storage, we offer individuals a wide range of storage solutions for their personal belongings. Not only can we store RVs but we can also help in protecting boats, cars, and other personal items in our self-storage units. We encourage individuals who have invested in RVs to strongly consider our facility due to the many number of amenities we offer and the various storage unit sizes available. From 5' x 5' to large 20' x 20' spaces in a warehouse facility, we provide ample space for even the largest of recreational vehicles. Our large facility also helps by providing 24 hour video monitoring and surveillance which can further protect our customers' investments. 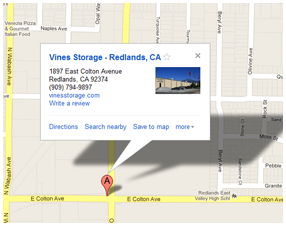 If you live in the or around the Redlands area and have considered the advantages of long term RV storage, contact Vines Storage today and ask for a tour of our facility. Not only do we provide long term leasing options but we also have some month-to-month, short-term plans that may be catered more to one's needs and desires. Call today to book a time to speak with our storage facility manager and learn about RV storage options that accommodate your needs.